Dassault Mystère IVA preserved at the Musée de l'Air. The Dassault MD.454 Mystère IV is a 1950s French fighter-bomber aircraft, the first transonic aircraft to enter service with the French Air Force. Israeli Mystère IVs saw action during the Arab–Israeli wars and were joined by the French Mystères for the Suez crisis. France was the main operator of the Mystère IV and at the peak usage operated 6 squadrons. Most of the aircraft were purchased under a United States Offshore Procurement contract and many were returned to US custody after they were retired. In April 1953 the United States government and the United States Air Force placed an order for 223 aircraft to be operated by the French. The new Mystère IVs were used in the 1956 Suez Crisis and continued in use into the 1980s. The Mystère IV became Israel's first swept-wing fighter when an order for Mystère IIs was changed to 24 Mystère IVs in 1955, which were delivered from April to June 1956, equipping 101 Squadron. A further 36 were delivered in August 1956, with a final aircraft, equipped for reconnaissance duties, delivered in September 1956. On 29 October, when Israel attacked Egypt in the opening move of what became known as the Suez Crisis, invading the Sinai Peninsula, the Mystères of 101 Squadron were deployed on both air-to-air and ground attack missions. On 30 October 1956 the Mystère IV got its first kill when eight aircraft fought 16 Egyptian Air Force MiG-15s. The Mystères shot down one MiG while a second MiG and one of the Mystères were damaged. On the next day, two Mystères engaged claimed four Egyptian De Havilland Vampires shot down, with another MiG-15 and a MiG-17 claimed later that day. Israeli Mystères flew a total of 147 sorties during the war, for the loss of a single aircraft, shot down by ground fire on 2 November. A second squadron, 109 Squadron was equipped with the Mystère IV in December 1956, while 101 Squadron passed its Mystères to 116 Squadron in November 1961. Israel planned to replace the Mystère IV with the Douglas A-4 Skyhawk, but 109 and 116 Squadron still operated the French fighter on the outbreak of the Six-Day War. The Mystère was used as a ground attack aircraft during the war, flying 610 sorties, claiming three Arab aircraft (two MiG-17s and a Jordanian Hawker Hunter) shot down for the loss of seven Mystères, five to ground fire and two by enemy fighters (one by an Egyptian MiG-21 and one by a Jordanian Hunter flown by PAF pilot Saiful azam). The Mystère was finally retired from Israeli service on 18 March 1971. India procured 104 of aircraft in 1957 and used them extensively in the Indo-Pakistani War of 1965. On 16 September 1965 a Mystère IVA shot down a Pakistani L-19. On 7 September an Indian Mystère was rammed in the air by a Pakistani Lockheed F-104 Starfighter in a raid over Sargoda. Both the Mystère and the Starfighter crashed. The Pakistani pilot was able to eject and do a last minute deployment of his parachute but the Indian air force pilot Devayya died in the crash and was awarded the Maha Vir Chakra posthumously, 23 years after the battle. During the campaign Mystère IVs also destroyed Pakistani aircraft on the ground including four F-86F, three F-104 and 2 Lockheed C-130 Hercules transports. The phasing out of the aircraft started soon after the 1965 Indo-Pakistani War, though it saw further action in the Indo-Pakistani War of 1971, it was completely phased out of the Indian Air Force by 1973. Production fighter-bomber, 421 built, first 50 with the Rolls-Royce Tay 250 the remaining 371 with a French derivative of the Tay, the Hispano-Suiza Verdon. In addition to production Mystère IVA, Dassault developed an upgraded Mystère IVB with either Rolls-Royce Avon (first two prototypes) or SNECMA Atar 101 (third prototype) afterburning engine and a radar ranging gunsight. Six pre-production aircraft were built but the project was abandoned in favour of the promising Super Mystère. In 1954, French pilot Constantin Rozanoff was killed while doing a low-level flyover of this aircraft. The only Mystère IVN in flight. Israeli Air Force, 61 delivered. ^ Swanborough, Gordon; Green, William A (2001). An Illustrated anatomy of the world's fighters: the inside story of over 100 classics in the evolution of fighter aircraft. Osceola, WI: MBI Pub. p. 196. ISBN 0-7603-1124-2. ^ Aloni Air Enthusiast March/April 2005, pp. 15–16. ^ Aloni Air Enthusiast March/April 2005, pp. 17–18. ^ Aloni Air Enthusiast March/April 2005, p. 18. ^ a b Aloni Air Enthusiast March/April 2005, p. 19. ^ Aloni Air Enthusiast March/April 2005, p. 20. ^ Aloni Air Enthusiast March/April 2005, pp. 21–23. ^ Aloni Air Enthusiast March/April 2005, p. 23. ^ "Devvaya", Maha Vir Chakra Recipients, Bharat Rakshak . ^ B. Harry (2 September 2006). "IAF COMBAT KILLS - 1965 INDO-PAK AIR WAR" (PDF). orbat.com. Archived from the original (PDF) on 27 November 2010. Retrieved 9 September 2010. ^ Aloni Air Enthusiast March/April 2005, p. 16. ^ a b Green and Swanborough 1994, p. 149. ^ a b c Aloni Air Enthusiast March/April 2005, p. 15. ^ Bridgman 1955, p. 139. Aloni, Shlomo (March–April 2005). "Swept-Wing Backbone: Mystère IVAs in Israeli Service". Air Enthusiast (116): 12–23. ISSN 0143-5450. Bridgman, Leonard (1955). Jane's All The World's Aircraft 1955–56. New York: McGraw-Hill. Donald, David; Lake, Jon, eds. (1996). Encyclopedia of world military aircraft. AIRtime Publishing. ISBN 1-880588-24-2. Green, William; Swanborough, Gordon (1994). The Complete Book of Fighters. New York: Smithmark. ISBN 0-83173939-8. Kopenhagen, W, ed. (1987). Das große Flugzeug-Typenbuch [The large airplane type book] (in German). Transpress. ISBN 3-344-00162-0. The Illustrated Encyclopedia of Aircraft. Part Work 1982–1985. Orbis Publishing. 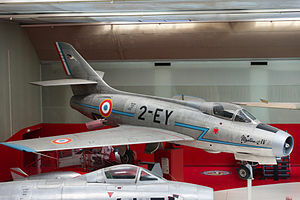 Wikimedia Commons has media related to Dassault Mystère. This page was last edited on 21 April 2019, at 19:24 (UTC).